Get up and running quickly with your hudl2 tablet from Tesco. This pocket-sized guide covers hudl2 with Android 4.4.2 Kit Kat. The hudl2 is the second generation of Tesco's fully-featured tablet. Available in eight striking colours the hudl2 is an 8-inch device that offers everything that you need for your modern mobile computing needs. 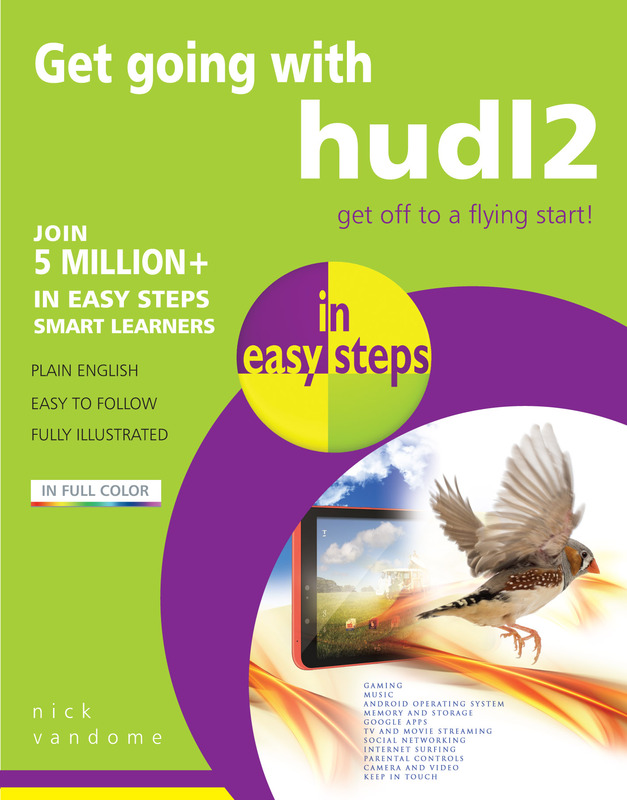 Get going with hudl2 in easy steps is a full-colour, compact and concise quick-start guide that will help you get up and running quickly with your hudl2. It shows how to set it up ready for use and the fundamentals of navigating your way around its interface and screens. The hudl2 keyboard is also covered, as are pre-installed apps and those that can be downloaded from the online Play Store. Entertainment is an important part of any tablet and this is well catered for with the hudl2. The Get going guide shows how you can use it for listening to music, with either Blinkbox, or the Play Music app, watch movies and TV shows, read books and make the most of your photos, including using the two cameras on the hudl2. The hudl2 is not just a fun device, it is also extremely functional and a great way to stay in touch with family and friends, with a range of pre-installed apps. These include using email, the address book and the calendar. Using the Web is another essential part of modern life and there is a chapter that shows how to use the default Chrome browser to get the most out of your online experience. When you get your hands on a hudl2 you will want to start using it as soon as possible. Get going with hudl2 in easy steps helps you do this by giving you the information that you need, in a compact format that is ideal for keeping next to your hudl2 for easy reference. Covers hudl2 with Android 4.4.2 Kit Kat. "An excellent source for Hudl2 users. A lot of essential information, easily accessed in one small volume, easy to follow and shows how to navigate around your tablet and guide you to all the functions of the Hudl2. Well illustrated with screen guidance, using apps, downloading, playing music videos, storage of photos etc, It is a small volume but totally dedicated to the Hudl2 and is my first source of reference as a concise and very useful guide, problem solver and is written in plain language with clear instructions. A good buy in a small package." From an Amazon reader.